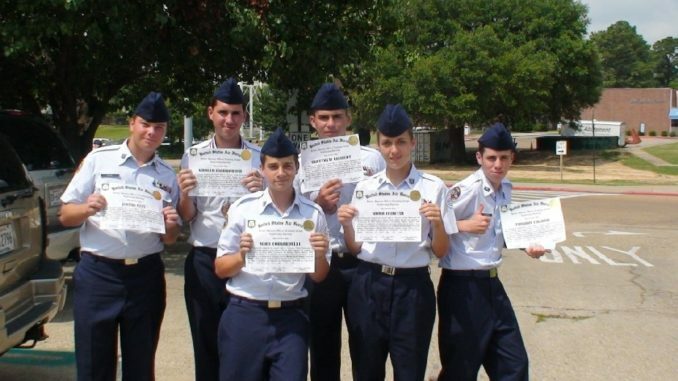 Hahnville High School students from LA-933 attended a week long Summer Leadership School sponsored by the Senior ROTC Program at Louisiana Tech University. During their time at camp the cadets were given instruction on Leadership Principles, Drill, Physical Activities and effective Corps Management. Two of our cadets were recognized for exceptional leadership performance. Both Cadet Khaled Mohammed and Cadet Matthew Grabert earned the Leadership Award. Pictured (L to R): Justin Este, Khaled Mohammed, Matthew Grabert, Anna Martin, and Thomas “Tom-Tom” Colomb.